Fillip found the weak link in his pen last year, after we moved the sheep that got terrorized by kids. He took full advantage of it. I found a pile of afterbirth this evening when I went out to feed. 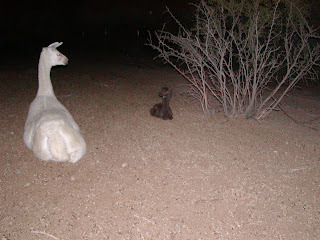 Neither of the llamas looked pregnant, and I had asked my friends. I figured nothing had happened. 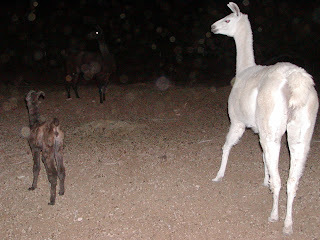 Marc got home as I was running in to get a flashlight and he walked up the wash with me to find the llamas. They did not come to eat, so I should have realized something was up. Emmy and Brillo were in a huge spitting contest this morning. Now I know what that was about. The baby is definitely Emmy's. It looks like it might be chocolate brown, but I won't know till morning. Flashlights and the camera do not really help. Emmy had no udders when I was out there at 6, so I went back out with grain a short while ago. She does now. 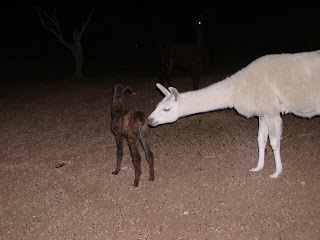 Looking at her backside, there is no discharge or anything to indicate that she is the mom. The bonding between her and the baby is obvious. I took the time while I was out there to check Brillo. I would not be a bit surprised, if she delivers tomorrow. Her back end is moving in a very strange way and I do not think that she is constipated! Too bad the baby was not born before the wool festival. That would have been a real treat. Anyhow, life is never dull on the ranch!